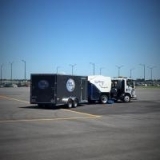 We understand that regular maintenance sweeping keeps your parking areas clean and free of debris... and much more. Regular maintenance air sweeping also reduces track-in of grit onto your interior floors and decreases maintenance needs like striping and sealcoating on your parking areas. 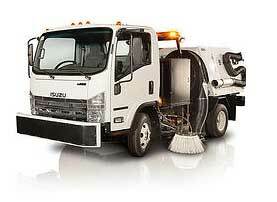 Our high-powered air sweeping trucks sweep up litter and take it away. Our services include power sweeping parking areas and driveways. We also use backpack blowers to blow litter from sidewalks and walkways into the path of our sweepers in order to keep all those areas spotless. Many customers also have the Moonlight Sweeping professional operators replace their trash can liners. If you are planning to host a large-scale commercial event, then you will definitely benefit from our help in clearing out all kinds of debris before, during or after the event. 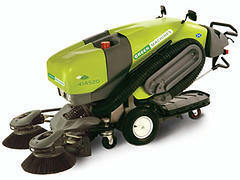 We have a specialized sweeper designed for maximum productivity in event cleanup situations. 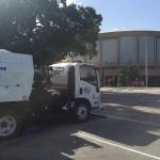 Our Tennant Green Machine allows event cleanup to be done in a focused manner; we can even do cleaning during the event without concern about event-goers. 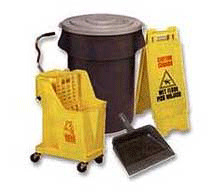 At Moonlight Sweeping LLC we provide the exact level of ongoing services you need. We'll make sure the event grounds are sparkling prior to 'show time,' then handle maintenance throughout the event and clean up afterwards. Make your next event clean and safe by specifying Moonlight Sweeping to handle your cleaning details. Keep your property clean and neat, all day – every day. We offer day portering services at an agreed-upon schedule that is right for your property, on any and all days of the week you specify. Day portering is also perfect for outdoor events, tent sales, etc. We schedule in order to meet the unique requirements of our clients' day time operations. We can maintain the exterior of your buildings by removing trash and debris from sidewalks, turf, mulch beds or anywhere else it has accumulated. We also can replace trash liners throughout the day. You will find that your customers will appreciate patronizing a facility that is neat and clean, with available garbage containers that aren't overflowing, whenever they visit. Eliminate graffiti immediately with our power washing services. We offer hot water pressure washing that can utilize steam cleaning up to 220 degrees. 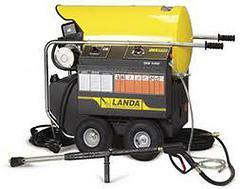 Our pressure cleaning system gets rid of gum spots, oil spots, paint on concrete and most any other types of stains! We also offer cold water power-washing, since some times all it takes is cold water to clean a dirty area. If you have any areas that need stains or graffiti removed, just give us a call for a no-charge professional assessment. If you are located in the Greater Kansas City area, we urge you to see the difference we can make in your property's exterior maintenance 'look and feel.' The Moonlight Sweeping pros will provide you with a level of service that keeps all of our client properties looking at their very best. Use the information shown to the right to contact us today!